Kale is a variety of cabbage that parallels traits found more commonly in wild species, as opposed to the domesticated tight-head varieties seen at most farmers’ markets and food stores. It is also called Borocle, which is thought to have originated from the Dutch boerenkool, meaning “farmer’s cabbage”. Kale is a member of the Brassicaceae family, and also known as a Cruciferous Vegetable. I’m just going to link rather than attempt to explain the ins and outs of biological classification. By the way, that was me being kind of lazy; it doesn’t happen often, but I’m sure most of my readers don’t care about taxonomic rank. If you happen to be one who does, I’d be glad to suggest further reading. I’m sure I’ve worn out my welcome on those books at the library anyway. Notice the cross like formation of the flower petals? The word Cruciferae is Neo-Latin for cross-bearing. Flowering kales, sold as ornamental cabbage, are edible as well. 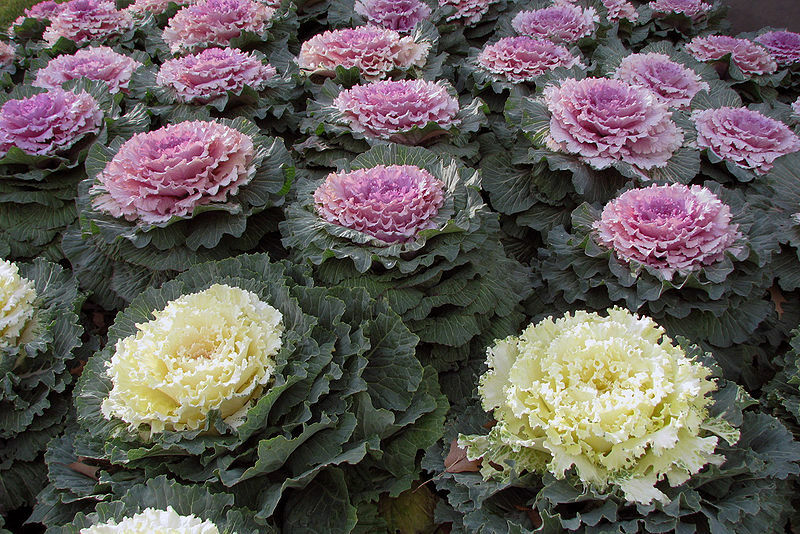 Their rosette can be found in brilliant shades of pink, lavender, white, blue, violet, and red. Growing up we always had the pink and purple shades. I do believe flowering kale may make its way into this Fall’s edible landscaping! 1. When steamed, the fiber-related components bind easier to bile acids in your digestive track, which allows for easier excretion, thus lowering your cholesterol. 2. The Isothiocyanates (ITCs) in kale lower your risk for breast, ovary, colon, bladder, and prostate cancers. 3. ITCs play an integral role in assisting with the detoxification system. I can surely attest to this! I’ve eaten an obnoxious amount of kale over the last few days. My over-wintered plants are beginning to bolt, so I wanted to eat them before the leaves turn bitter. Have you ever been standing next to someone who has recently eaten a lot of garlic? They seem to be surrounded by a strange aroma. Yeah, well, kale apparently does that to me and I don’t think my coworkers are very happy about it! Guess I’ll have to bring in a soy candle to burn when it’s a heavy kale consumption day, because I’m sure not going to stop eating this cruciferous veggie! 4. With over 45 identified flavonoids, kale’s antioxidant and anti-inflammatory benefits are unsurpassed. Oxidative stress and chronic inflammation are risk-factors associated with cancer. Sautee onions over med heat with olive oil until they begin to brown, about 6 minutes. While the onions are cooking, in a small bowl, whisk together garlic, sun-dried tomatoes, sun-dried tomato oil, curry paste, sugar, and sriracha, then add it to the onions. Cook for about 2 minutes, then add potatoes and water; mix well. Bring to a boil, reduce heat, cover, and simmer for 10 minutes. 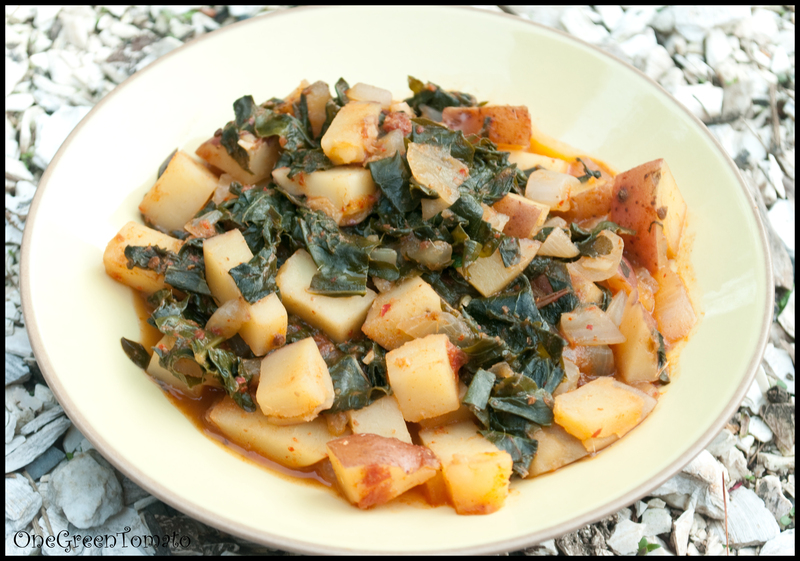 While potatoes are cooking wash kale and remove large stems and midribs; slice into strips. 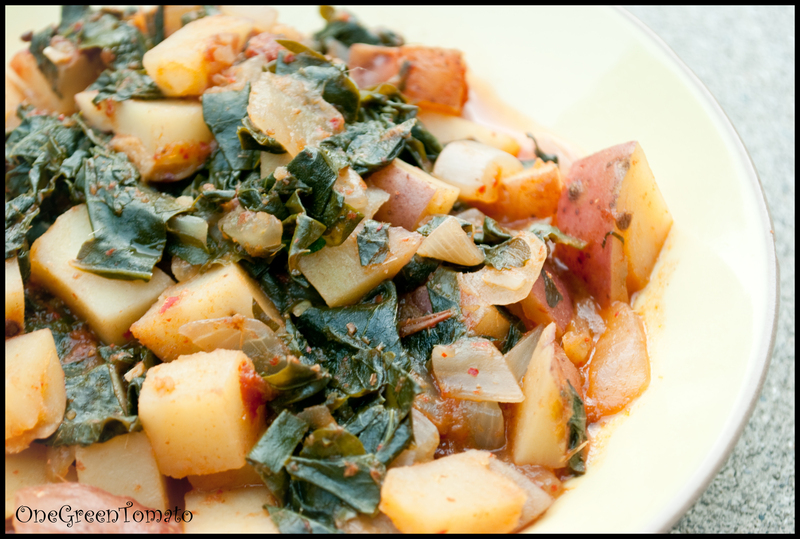 Add kale, cover, and continue cooking for an additional 10 minutes or until potatoes are tender. For more delicious kale recipes check out the following posts: Kale Chips and Garlic, Kale and Chickpea Soup.